Let the hoops commence. The NBA starts today with Celtics vs. Heat and Lakers vs. Mavericks. 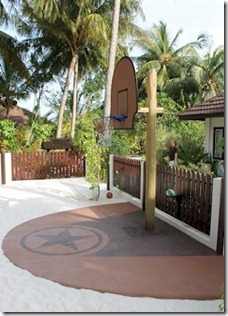 For aspiring hoopsters or young fans, the resort of the day is Lily Beach. An increasing number of resorts have basketball courts (perhaps as the sport grows increasingly international), but only Lily Beach has a junior hoop at its kids activity centre. No not American Thanksgiving. But the National Holiday of Turkey, ‘Republic Day’. And the resort of the day is Ayada. 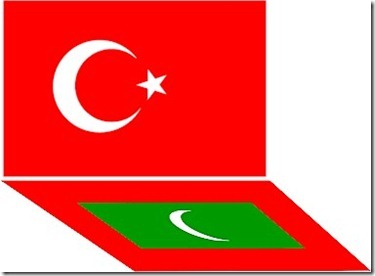 Post Script – For a Turkish language website on the Maldives, check out www.maldivler.com.tr . 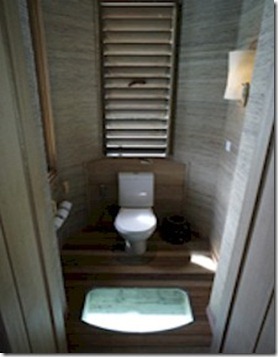 Like glass floors, private back areas are another prominently requested feature for Maldive villas. Especially for modest Middle Eastern women who prefer not to wear skimpy beach clothes in public view. Also, the numerous honeymooners that flock here like a little privacy to take the ‘P’ out of ‘PDA’. 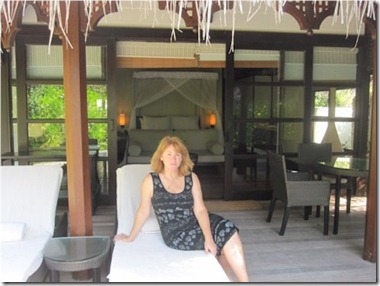 Most villas in the Maldives have some sort of private back area, but they differ widely. From just enough space for an outdoor shower to expansive, walled gardens with private pools and other amenities. That is why I include a picture of the back areas in the Room Type Profiles. 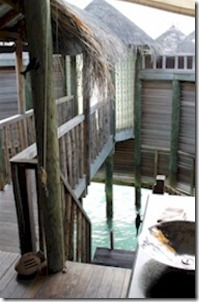 Now water villas have the entire ocean for their ‘back area’. Great for sunsets, marine life watching, handy snorkelling, and lovely ocean views. 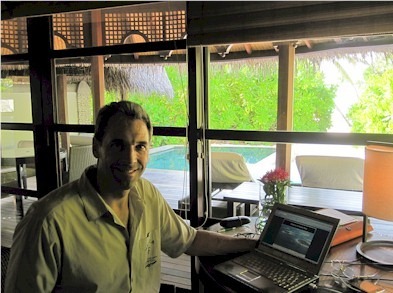 Regardless of the screens, walls and configuration, not super for privacy (at least from the ocean side). 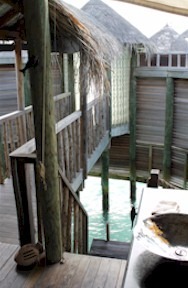 But Gili Lankanfushi has private ocean swimming areas on its water villas. Areas of the sea walled off 360 degrees that you can swim or whatever in. Sort of its own version of private ‘water closet’ altogether where you don’t just see the lagoon, but you are in it. Don’t get too bold in the ostensibly private setting. The water is eztremely clear and people could probably see a bit of what is going on from the adjacent walkway at least some of whatever is under water. For Windows! That’s the tag line (one of them) for Windows 8 launching today around the world. My Facebook page and Twitter feeds are packed with former Microsoft colleagues whooping with delight at their new release (launch times are are always a bit frothy in Redmond, especially for the franchise product). In honour of Windows 8 (and in the interest of balanced coverage), I thought I would showcase some superlative Windows in the Maldives. 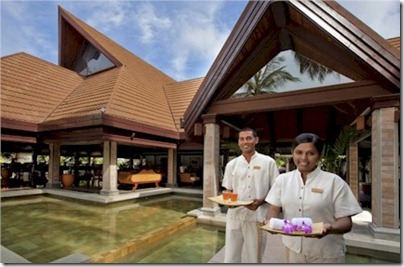 Particularly those of Four Seasons Kuda Huraa villas. Maybe it is my Microsoft heritage, but one of my pet peeves in any building, especially resorts and hotels, is not enough windows. Especially in a picturesque destination like the Maldives. Yes, we do spend as much time as possible outside on our visits, but sometimes you just have to or want to be inside. Maybe for a dose of refreshing air conditioning. Maybe because you have to or want to get on the computer (a la photo above). It is a shame that in such cases you have to abandon the beauty you came to experience. The most striking design he have some across in our worldwide travels is the Phinda Forest Lodges in the Kruger, South Africa. They are constructed of 3 walls of floor-to-ceiling glass. Yes, you can lower blinds for complete privacy, but the fun part is just opening them completely and still feeling immersed in the lush surrounding jungle. We were resting in our room one mid-day after a crack-of-dawn safari and just watched all the gazelles and monkeys playing a few feet away outside. 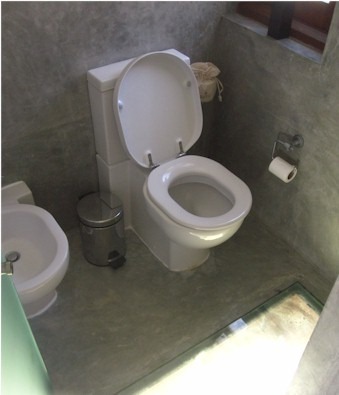 The closest we have found to this design are the Kanuhura villas which have a very similar design (see photos). 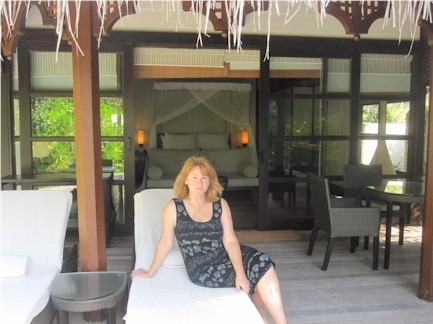 You do more often find floor-to-ceiling glass on one wall of the new water villas around the Maldives, thank goodness. But wrap-around transparency is still a novelty. Windows everywhere. Just like Microsoft would like it. 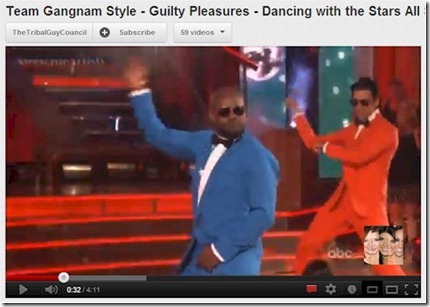 Mind you, being Secretary General of all the countries of the world still comes in behind being a Gangham Style rapper! The latest Gangham Style tribute was on last night’s US hit television show ‘Dancing With the Stars’ (a favourite of Lori and me). The show itself is a virtual UN with dancers from France, UK, Russia, Ireland, Venezuela, Brazil, Ukraine, Albania and, of course, USA. As Apple announced today, sometimes you just need a little iPad. Even sequested on an exotic ‘no shoes, no news’ island. Some people do miss their daily news tidbits, sports scores, and Facebook cat pictures over coffee in the morning. 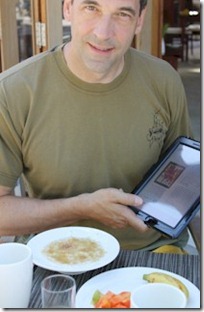 Lily Beach has its own offering for people who need a little iPad fix with their ‘iPads at Breakfast’ offering. 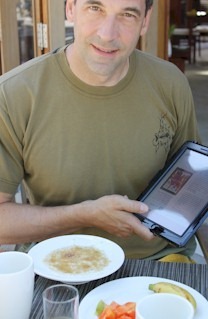 They keep a selection of iPads at the restaurant that guests can borrow and use in the dining area in the wifi hot spot. You think a Starbucks is overpriced? Try “Black Ivory”. It sells for $1,100 per kilogram. Why so much? Well, it is from coffee beans that have been ingested, digested and egested by elephants. Each bean hand picked from the elephant’s ‘output’ (for all of those teenage barristas moaning about their crappy jobs…you have no idea. Talk about having to wake up and smell the coffee). It’s the optional extras that get you. 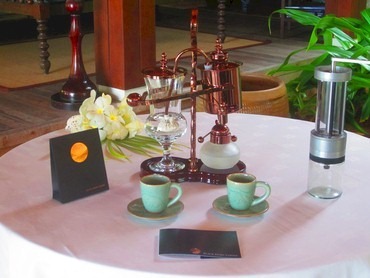 Just when we think we have gotten a great deal just within our budget, we come back a bit over-extended from all of the irresistible extras from souvenirs, diving, drinks and excursions. Special activities and special meals always seem to be a particular weakness for us and tote up some extra charges. 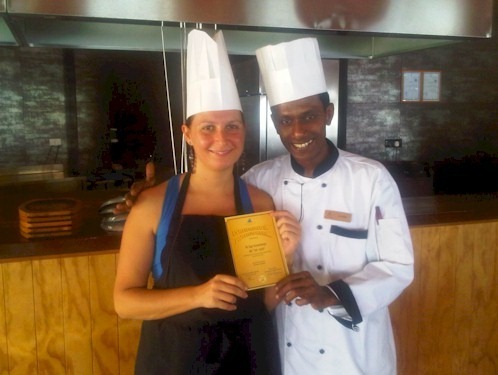 But at Vilamendhoo, you can do both a superb activity and get a great meal all for $25! It is their Maldivian cooking class. 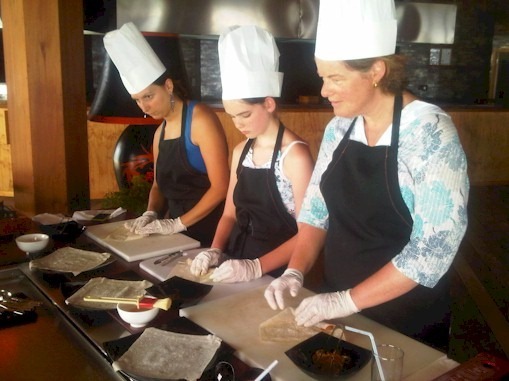 You will work with one of their Maldivian chefs learning some of their traditional recipes as well as try your hand at preparing them for yourself.